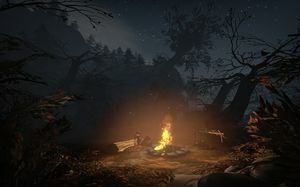 In a most unexpected turn, Starbreeze Studios' latest title is not another meaty FPS, but instead a small, download-only story-driven adventure. Is such a shooter-focussed developer capable of emotional range outside "rage" and "suppressed rage"? Joshua Drummond takes a look. 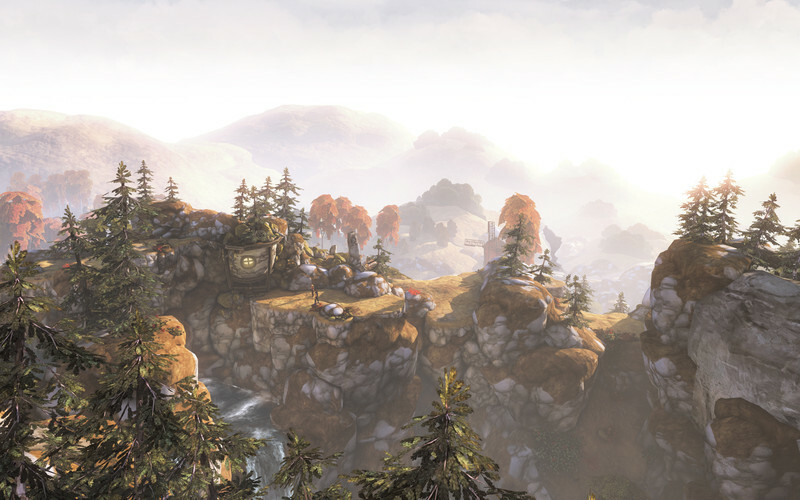 Brothers: A Tale of Two Sons is easy to sum up glibly – it's like Ico crossed with Journey, in a pseudo-Norse setting. But this is not a game to be summed up glibly, and while it clearly stands on the shoulders of and even pays occasional overt homage to those games, Brothers stands out. It is a work of art. Story-wise, it begins simply. You play as the titular two sons, who are seeking medicine for their ailing father. 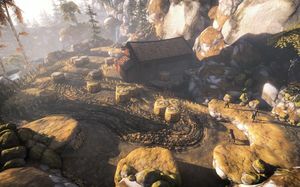 Much of the world this occurs in is taken directly from Norse mythology, which offers a feeling of instant familiarity – after all, most of Tolkien, and subsequently much of gaming, draws from similar source material. But there’s some delightful stuff here you might not have seen before, and some of it is very dark indeed, especially given too much thought. Brothers is played with only four controls: the left and right triggers and the thumbsticks. Your right hand controls the little brother, and your left the older brother. It sounds, and is, simple. It's also particularly clever, playing on the concepts of handedness and left/right brain dominance. This allows story elements to be directly conveyed through gameplay in a manner both subtle and brilliant. For instance, nearly all gamers are used to moving characters with their left hand, so that control is mapped to the big brother. This – just by virtue of muscle memory – makes him more sure of himself, more in control. Conversely, the little brother is moved by the more unfamiliar right stick, and this makes his character wayward, prone to distraction, and occasionally lag or run ahead (or into walls). Anyone who's had to take care of a trying little brother will be familiar with the experience. Brothers would deserve kudos for even trying to render story through gameplay in this way, but the fact that it performs as well as it does is worthy of truly high praise. Other gameplay elements like switch-flipping and climbing are contextual and mapped to the left and right triggers. These are a bit more obvious. The big brother is stronger, and the little brother is more nimble. This means the big brother isn't able to fit through small spaces and the little brother can't throw heavy switches. They must work together to get around the various obstacles the game world throws at them. The combined effect of these factors is that the game is always forcing your mind to jump through hoops. It's like trying to pat your head and rub your belly at the same time. Its puzzles are brain-bending without being hard – the solution is often immediately obvious, but thanks to the unique gameplay, getting it right is immensely satisfying. 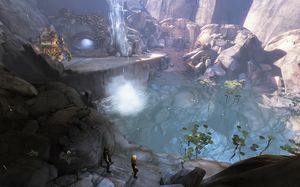 Of course, all this would just make for a mildly interesting puzzle game if it wasn’t for the fact that it all takes place in one of the most beautiful worlds ever to be realised in a game. The game looks merely good in terms of raw graphical prowess, but the overall experience is like moving through a painting. It’s not perfect, of course. 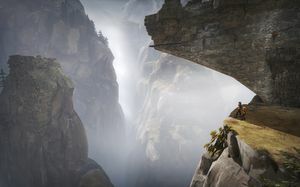 The novelty of Brothers’ approach brings with it some tricky controls, and graphical and physics bugs also make unwelcome intrusions, like when a character or piece of scenery clips, or the laws of physics bend mid-jump. These events are uncommon, but yank the player out of the world nonetheless. However, the gameplay is mostly smooth and solid. Brothers is also a remarkably short and easy game, but this works mostly to its advantage. It gives itself just the right amount of time to tell its tale without overstaying its welcome. Each chapter evokes a particular mood. Close to home, warm autumn colours and happy villagers make you feel safe, despite the importance of the mission at hand. The brothers might goof off, swap talk (which is all in gibberish, neatly avoiding the problems of either having a silent or a scripted game), or even shoot some hoops. However, things get more sombre as the journey progresses, and some moments that begin light-hearted curdle in an instant. Several story turns hit like a punch to the gut. Brothers was developed in collaboration with Swedish film director Josef Fares, and under his excellent direction the story is both beautiful and harrowing, featuring powerful themes of grief, loss, and determination. A swelling soundtrack and stunning environments – troll-filled caves, icy lakes, towering mountains – form a perfect backdrop to one of the most evocative videogame stories ever told. Videogames can be art, they can be beautiful, they can have all the power of myth. Brothers: A Tale of Two Sons is proof. 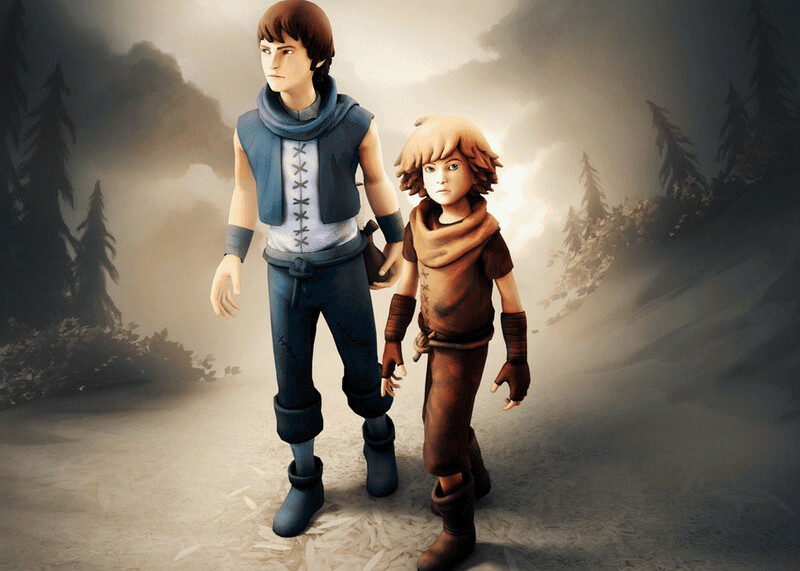 Brothers: A Tale of Two Sons isn't just pretty, it's story is downright magnificent. An at times harrowing but powerful title, it makes a strong case for the categorisation of videogames as art. Ups A stunning story conveyed as much by gameplay as by cutscenes; beautiful art direction. Downs Glitches occasionally diminish the overall experience. It's a particularly easy game.